Abstract: Here's a practical guide to ban work/life distractions, increase productivity and reduce stress. Whether you're a businessperson, community leader, parent or retiree, you can adapt an active role in enhancing your performance and quality of life—distraction free! Discover the root causes of your distractions, develop a 5-step plan and adapt strategies to move from good intention to positive action. 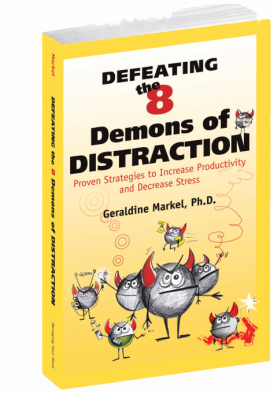 — Frank Petrock, Ph.D. President, The General Systems Consulting Group, Inc.
Abstract: This book is designed to arm workforce employees, independent professionals and family managers with simple yet powerful strategies to defeat the 8 Demons of Distraction. Anyone dealing with stress, rushing, over commitment, new technology, and/or special life circumstances can use this book to reduce everyday distractions and needless mistakes. Readers find an in-depth description of each Demon, its sources and its insidious effects on attention span, concentration, performance, productivity, and work/life satisfaction. Practical, step by step strategies will help you rid your life of formidable enemies such as the Unruly Mind Demon, the Technology Demon, the Activities Demon, and five others. This book supplies a research-based, proven plan of attack to increase your daily effectiveness and decrease stress at home and on the job. Abstract: Happiness is a basic human desire and one of the founding principles of the United States. Yet, it is something many find elusive. What fundamental truths will make us happy, even in turbulent times? In “Finding Happiness with Aristotle as Your Guide: Action Strategies Based on 10 Timeless Ideas” you discover how to deal with the problems of today and get back on the path to happiness. Vignettes show how the philosophical principles of Aristotle can be used to move beyond the stoppers to finding-or rediscovering-happiness. The 10 ideas and action strategies show you how to take control and stop feeling empty, overwhelmed, confused, or dissatisfied. Immediately, you start feeling fulfilled, satisfied, and certain. Defeating the Demons of Distraction: A Presentation in Recognition of National AD/HD Awareness Day, 2007. Abstract: An audio or video presentation that describes distraction as a primary characteristic of adults with Attention Deficit Disorder. Provides descriptions of 8 common demons and strategies to increase task completion, speed, and accuracy. Abstract: A handy job aid or reference, this 16 page, versatile, stand-alone, 3.5" x 8.5" booklet shows how to combat the competing forces that zap focus and energy at work and home. It can also be an ideal thank-you gift for friends, clients, vendors and other business associates. Abstract: This pack of 28 fast-reading, pocket-sized cards provides a personal coaching tool that can be used by individuals or in corporate training. Each deck contains the key ideas of important insights to increase productivity and descrease stress. In just minutes a day, you'll get everything you need to know to improve your life. Abstract: This light and lively CD helps you discover your memory style, visualize items for better retention, minimize distractions that contribute to memory loss, and develop your memory capacity. Includes a valuable insert about how to identify your memory style, keep a memory log, and use checklists, routines, and alarms. Abstract: This handy guide provides research-based techniques to help adults manage the day-to-day problems of life with ADD at home and work. The book draws upon the authorsâ own experience coaching people of all ages to develop workable solutions to some of the most troubling issues they face. This book offers hand-on tips to bring order to a chaotic life; learn tactics to improve memory; improve problem-solving, decision-making and goal setting skills; and manage the symptoms of ADD that hinder a satisfying life. Abstract: This guide is designed for middle school through post-graduate students who want to increase their academic success. Students are provided with easy-to-use, but powerful tips to complete assignments, perform well on tests and submit papers or projects on time. The guide opens with a self-check to identify areas of greatest needs, followed by 15 sections that include 25 tips on topics such as reading, memory, test taking, time management and organization; 15 tips for topics such as wellness and life skills, and 45 quotes to increase motivation and decrease stress. The guide ends with a handy checklist, â10 steps to Effective Studyâ illustrating how tips can be combined into an effective study process. Easy to share as Tweets, each tip contains 140 or less characters. — Timothy L. Walter, Ph.D., Dean of Academic and Student Services. Oakland Community College. — Eric Middleton, Ph.D., Counseling Psychologist. University of Michigan Medical School. New Edition! Solving the College Admissions Puzzle: A Guide for Students and Families About College Selection, Essay Writing and High-Stakes Testing. Abstract: This friendly, step-by-step guide helps students and their families get a grip on the confusing and complicated process of getting into the right college. Three experts provide strategies to tackle those daunting college choices and applications, write those mystifying application essays, and study for those nerve-wracking college admissions tests. Practical advice to make the college admission process successful, sane, and—yes, even enjoyable. Includes worksheets and action plans. Abstract: This guide gives parents of college-bound students the know-how to navigate their family through the world of admissions test preparation and to motivate their children to improve their study skills and become better test takers.Readers are given advice on which test their child should take and what type of preparation is best for their child. Tips and strategies are provided on changing teenagers’ attitudes and motivating them to prepare for their tests. There is a chapter devoted to the special problems of students with ADHD and learning disabilities. Abstract: This three CD set is a complete, unabridged version of the book. It includes a handy insert of tips. Allows you to listen on the go - in your car or on your computer, iPod or MP3 player. Abstract: This problem-solving guide gives teachers and other professionals the information and materials they need to improve the academic and social skills of teens with ADHD and/or learning disabilities by developing appropriate educational programs for them. A practical checklist format makes it easy to locate essential information, and hot topics such as self-management, motivation, homework completion, medication, and assistive technology are covered in detail. The book includes interesting student case histories throughout, over 100 reproducible graphic organizers, and specific recommendations for involving parents. A special appendix at the end of the book identifies 20 common classroom problems, from excessive movement, procrastination and defiant behavior to poor test-taking skills, and lists strategies to help students with ADHD and/or learning disabilities. Performance Breakthroughs for Adolescents with Learning Disabilities or ADD: How to help students Succeed in the regular education classroom. Abstract: This book focuses on teaching students how to manage their own behavior and on ways teachers, parents, and students can arrange the learning environment to maximize student strengths and overcome or bypass student weaknesses. This how-to book is useful for the entire class, not just students who have ADD or LD. College students and adults with ADD or LD can use the checklists and strategies in the book to enhance their performance both in school and on-the-job. Publisher: Research Press, Champaign, IL.